Elegant models from Lady Collection line were first introduced in 2007. 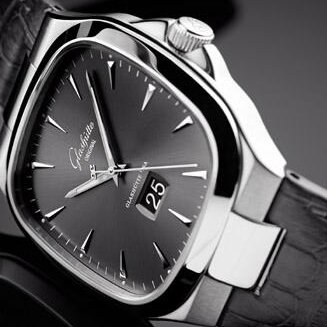 To buy Lady Collection watches by Glashütte Original is possible in several versions. The company updated its new collection of women's watches, represented in different variations and design variants. This time dials, their colors and gems have been redesigned that turn models into a sophisticated masterpiece. Lady Serenade watch, characterized by a singular femininity and elegance, is marked the beginning of a new generation of classic women's watches. From this series at the world exhibition are presented several models (Ref. / 39-22-12-11-04 /, / 39-22-13-11-04 /, / 39-22-14-11-04 /), performed in cases of 18-karat pink and decorated with diamonds. The first model with a gold case has a galvanic brown dial with golden hands, diamond hour markers and soft curved lines across the dial’s surface. These watches are available on a brown alligator strap and a satin strap in bronze color. The second model with a golden case is equipped by a pearl dial in soft pink color, with golden hands, diamond markers, and beige alligator strap. The third model is characterized by a gold case and gold stripes on a white mother of pearl dial set with diamonds. This version of the watch is complemented by a bright orange alligator strap. Besides watches with gold cases, three more models - / 39-22-11-02-04 / / 39-22-12-02-04 / / 39-22-14-02-04 / are presented in the cases of stainless steel. The watches with steel case are offered in three versions: one has a blue mother of pearl dial, steel hands, diamond hour markers, soft curved lines across the surface of the dial and blue-gray leather strap. Another model has a white mother of pearl dial, with the hands of pink gold, diamond hour markers and a satin strap in color of mint. The design of the third model Lady Serenade in steel case is characterized by stripes of white gold that adorn the white mother of pearl dial, decorated with diamonds. This version of the model is complemented by a leather strap in bright orange color. The diameter of all the models’ case is 36 mm, and thickness - 10.2 mm. Each model represents the epitome of elegance. The bezel of the models is decorated with diamonds, giving the watches a luxury appearance. Large dials feature Roman numerals and date aperture at the 6 o’clock. The colored dials are protected by double-sided anti-reflective sapphire glass. The back side of the watch is also covered with a sapphire crystal, which allows to observe the work of an automatic mechanism 39-22, with a diameter of 26 mm, and thickness - 4.3 mm. The caliber is assembled on the 25 stones, equipped with a frequency of 28,800 vibrations per hour, and 40-hour power reserve.